"It's the second week of Rockatar camp and campers age 4-12 are having a good time while learning how to play musical instruments like keyboards, violins and drums" continues WFLA. 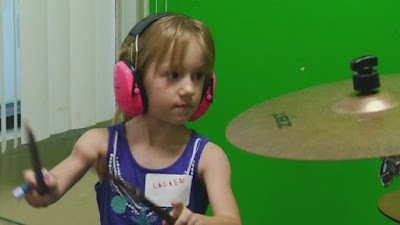 Campers spend five days learning a variety of musical instruments, then at the end of the week they put on a show for their parents and friends. The children are vey young, but Rockatar Studio Director Steve Bennion says this camp will help them prepare for school in the fall. "We believe that playing music is a wonderful addition to a child's education and helps their self esteem physical development and their ability to get up in from of a group and perform a song or speech or presentation," said Bennion. The instructors are made up of a combination of professional musicians, teachers and college students from the University of Tampa and the University of South Florida. Get more information about Rockatar summer camp here.